It’s common for children to thrive in a competitive environment. Competition can build self-esteem, motivate and teach the reward of hard work. However, when your child is on the losing end of a game, sporting event or classroom activity, the disappointment may not sit well with your little one (or your older one, for that matter). Children are not born with an innate ability to be a good sport; instead, sportsmanship is taught through modeling behaviors, strong examples and lessons about how to behave when faced with a disappointing loss. Learn how to teach your child to be a good sport through creative lessons that will stay with them for a lifetime. In order to teach your child good sportsmanship, it’s important to define it and equate the action to respect. Good sportsmanship is when children, adults, teammates, coaches, officials and opponents treat each other with respect, according to the parenting experts at Nemours KidsHealth. Talk with your children about examples they have witnessed of both good and bad sportsmanship. Discuss scenarios and determine ways you expect your children to behave when faced with a loss or even a win. Even if a child’s example involves an adult displaying poor sportsmanship, it’s important to evaluate how the actions could have been improved. It’s no secret that you are the primary model of good sportsmanship for your child. He is watching your every move and looking to you for cues on how to treat others. You can help your child understand the importance of good sportsmanship by expressing small gestures and heroic efforts to illustrate respect. 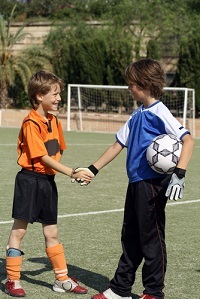 According to Nemours KidsHealth, these small gestures include shaking hands with the other teammates and opponents before a game, complimenting other players on their efforts and accepting calls of the game, even if you don’t agree with them. It’s important to express to your child that it is not always easy to be a good sport. Let them know that you understand how frustrating it is to lose a game or a contest. When validating their feelings, share examples of how you handled losses or rejection in your life and how you responded gracefully and respectfully. These lessons can significantly impact your child’s ability to get along with others throughout his entire life. “A child who practices good sportsmanship is likely to carry the respect and appreciation of other people into every other aspect of life,” say the child experts at Nemours KidsHealth. Lessons about how to be a good sport do not have to exclusively happen on the field. In fact, your child can learn much more about sportsmanship at home. Hosting a family game night is a necessary activity to observe your child’s developing sportsmanship and teach expectations. According to Marie Hartwell-Walker, licensed psychologist for PsychCentral, family game nights teach children life skills. These skills can help them develop social skills that display respect for others. As your children follow directions, take turns and offer friendly banter with each other, they are learning to read nonverbal cues and learn from errors, says Hartwell-Walker. “Regular game nights give kids practice in these essential skills and provide immediate feedback about what works and what doesn’t,” she says. In addition to teaching your children about good sportsmanship, giving them the opportunity to compete, communicate and play with family members at home or with friends on the field will help them develop a stronger sense of what it means to be a respectful team player.